This book takes the reader through a catalogue of sad, humorous, and almost unbelievable incidents in the life of a local policeman. 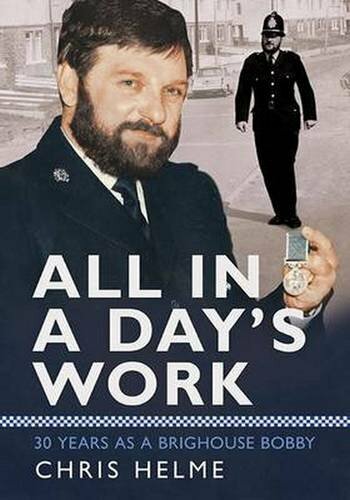 During the 1950s, Chris Helme was often asked by relatives: ‘What do you want to be when you grow up?’ A policeman was always his answer. A child of the Fifties, he was brought up to respect the local police who seemed to know everyone. Suffering from colour blindness and short of a few O-Levels, Helme was finally accepted to serve in Leeds City police; however, he joined the police in Bradford a year later. By 1975, he was in the West Yorkshire Police achieving his life’s ambition by serving his hometown of Brighouse and was the local policeman on the same housing estates that he grew up on. All in a Day’s Work: 30 Years as Brighouse Bobby is his journey to achieving that ambition culminating with being awarded the British Empire Medal for services to his community in 1990. A local bobby had to deal with everything that happened on his ‘patch’. This book takes the reader through a catalogue of sad, humorous, and almost unbelievable incidents in the life of a local policeman.